Keto chicken patties are made with the reserved chicken breasts from homemade keto broth. By making a batch of chicken broth and using the leftover chicken you can cook once and eat twice. 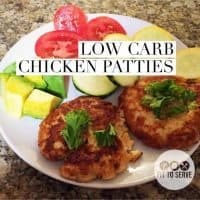 Making low carb chicken patties from your leftover chicken is a great way to save time and a creative way to meal plan. Planning your keto meals ahead of time, especially if you are busy just makes sense. You can even make these keto chicken patties by using the breasts of a rotisserie chicken. These keto chicken patties come together easily. You shred your two cooked chicken breasts and add some eggs, parmesan cheese and spices. Then create your chicken patties and fry them up till crispy on both sides. Depending on the size you make these keto chicken patties, you can either serve them as part of the main meal or as an appetizer. If what you are after is keto chicken fritters, then simply keep your chicken patties small. This way they can eat them more like chicken nuggets. Whether you call these keto chicken patties, keto chicken cakes or keto chicken fritters one thing is for sure they are delicious. 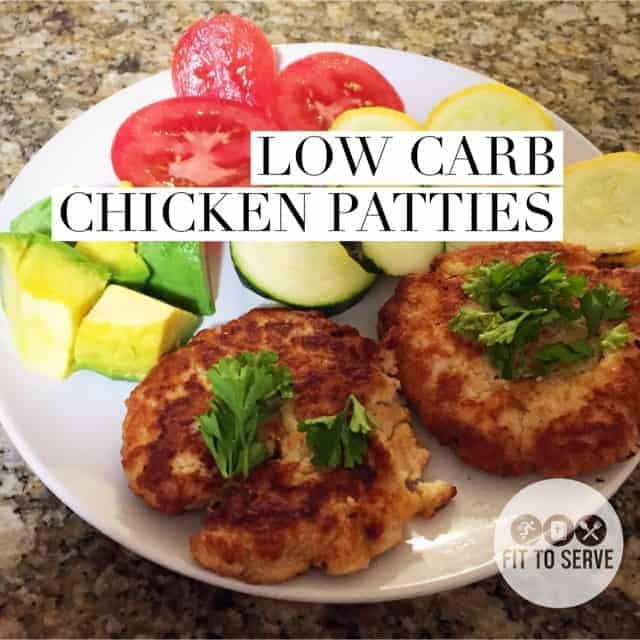 Not only do these low carb chicken patties come together quickly, but they are super easy to customize. You can really have fun adding any of the following combinations of ingredients for a different flavor profile. With just a few add-ins you can fully customize these keto chicken patties. Keto Bacon and Cheese Chicken Patties: Add 4 slices of cooked crumbled bacon, 1/4 cup of shredded cheddar cheese to the chicken mix before forming the patties and cooking. Tex Mex Keto Chicken Patties: By adding 1/2 teaspoon of cumin powder, 1/2 teaspoon of chili powder,1/4 cup of shredded cheddar cheese, plus 2 tablespoons of finely chopped pickled jalapeños, you can have a Tex Mex version of these patties. Keto Mushroom and Swiss Cheese Patties: Add 1/4 cup of sautéed mushrooms and onions as well as 1/4 cup of shredded Swiss cheese. Taking the extra time to plan out your keto meals will take the stress out of what to serve for dinner every day. If there is one thing I tell our FITTOSERVE Community Group is to cook once eat twice whenever possible. Simply put, if you’re going to go through the trouble of turning on your stove, why not make two meals out of your efforts? This recipe makes a large batch of chicken broth and enough leftover chicken to use in more than one meal. Since you will be using only the leftover chicken breasts for this recipe, shred the remainder into the chicken broth for a simple basic keto chicken soup. For the keto chicken soup, you will chop up a whole chicken and cook in 2 quarts of water that has been flavored according to the recipe. Once the chicken is cooked, remove the chicken breasts since you will be using them for the keto chicken patties. Then shred and debone the rest of the chicken parts and add back into the stock pot with 2 cups of your favorite chopped low carb vegetables for a quick chicken soup. This recipe for keto chicken patties was submitted by my dear friend Martha Avila who is the president of Heartbeat of Miami. Since 2007 Heartbeat of Miami Pregnancy Help Medical Clinics has been providing “lifesaving help in a life changing way” to women and couples with an unplanned or unwanted pregnancy. If there is someone who has every reason to plan out her meals, it’s Martha. As the president of this life-giving organization, her schedule is extremely demanding. In fact, when I think of who FITTOSERVE can assist, I always see the Marthas of this world. These are the people who are always serving others and need to be reminded from time to time of the importance of taking care of themselves too. It’s what so that they can be fit to serve and continue to live out what God has called them to do. Our family has supported this ministry since its inception, and it’s been a true honor to see firsthand what a blessing this non-profit organization is to our community. Thankfully, Martha gets it. She understands that a little prep time will go a long way when it comes to staying on course on a low carb/keto plan. As an active member of FITTOSERVE Group, she has been known to create multiple meals out of one entrée. I am convinced that it’s her consistent planning that makes it possible to serve her community well. The following recipe for low carb chicken patties is one of Martha’s creations. It is a perfect example of why it makes sense to cook once and eat twice. Give to Heartbeat of Miami on November 15, Give Miami Day! Give Miami Day is sponsored by the Miami Foundation who brings nonprofits and donors together to help create historic moments in the community. It’s a 24 hour online giving event that helps amplify the donations that go to the non-profits who make this city better. Every year on Give Miami Day the Miami foundation along with its partners match a percentage of every gift given. Heartbeat of Miami is one of the non-profits that benefit from this event. On November 15th consider giving a donation to this amazing organization. I encourage you to visit their site for more information about the ministry of Heartbeat of Miami. You can also find them on Facebook and read the testimonies for yourself. Every donation that is given on this day is matched by the Miami Foundation and its partners giving you the opportunity to make your one-time donation to go further. Keto Chicken Patties. Cook once eat twice by making a chicken stock and reserving the chicken breast to make chicken patties. Add all the ingredients to a large stock pot. Cook at low to medium heat for two hours or until chicken is fully cooked. Strain all the chicken and vegetables and reserve the broth as stock for a keto chicken soup. Use the two chicken breasts for the keto chicken patties. The rest of the chicken can be shredded and used for the keto chicken soup. In a large mixing bowl combine the shredded cooled chicken breast, dry seasonings, two egg and grated parmesan cheese. Form 10 chicken patties and fry in a non-stick pan with coconut oil until lightly brown on both sides. You can make 20 chicken fritters by making your patties smaller. Garnish with parsley or cilantro and accompany with your favorite low carb vegetables. Hi Leonie, thanks for stopping by and commenting. It means so much to me that my little blog encourages you. Here to cheer you on??? This was a huge hit! Very easy to make and super tasty. I mixed everything together except the eggs and put it in the fridge to cook later. I swear the flavors were able to really blend in to the meat. Made this with Mediterranean roasted veggies. Husband gave a 10/10 and is still talking how great dinner was! Yay! So happy it was a hit in your home.